Leasing Available from $45.58 per month! The Lexmark X782e offers brilliant color output and a rich range of multifunction features all in a single high-performance, space-saving A4 device. 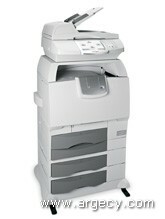 And it will boost your productivity with rapid print speeds up to 40 ppm (38 ppm A4) in mono, 35 ppm (33 ppm) in color. Unite brilliant color output with a rich range of features, including advanced scanning, copying and ultra-fast printing up to 40 ppm in black, 35 ppm in color- all simplified by an incredibly large, intuitive touch screen. The intuitive, award-winning touch screen is fully customizable and exceptionally user friendly. Scanning documents, printing in duplex, pulling up e-mail addresses, or previewing a scan or fax before you print- it's all literally at you fingertips. Includes some of the most sought-after security features, from advanced user-access restriction tools to a wide range of peace-of-mind features like disk wiping and encryption to secure data transmission (Secure Socket Layer) and confidential printing. Opt for one of Lexmark's leading workflow-enhancing applications to help you lower costs, analyze usage data, expand your functionality, and move information more securely. Just call your Lexmark representative to get started. Packaged Size (" - H x W x D) 31.9 x 31.3 x 25.6: 49 x 48 x 40 "
Size (" - H x W x D) 55.5 x 26.75 x 23 "
Packaged Weight (lbs) 150: 180.6 lbs.